Linking data about the wide range of goods that are stored in the databases of high street shops offers positive outcomes for consumers, the wellbeing of salesperson as part of the UK’s rapidly expanding service sector, health of the high street and the UK economy. Despite the tremendous connections that are made through shopping experiences on the internet, the high street remains locked in a 19th Century paradigm in which the cash register is the only interface between material goods, the customer and the stock inventory (database) (Carrier 1995). Shoppers work hard to make their own connections between disconnected shops, salespeople are reduced to scanning barcodes or fixing self-checkout machines, and data between all parties remains in silos. The vision of a ‘frictionless shopping experience’ (Brynjofsson and Smith 2000) that part an Internet of Things promise (http://www.youtube.com/watch?v=_xNhL39uD7I), in which technology can reduce the bottleneck of the cash register is far from being realised, instead shoppers have turned to ‘showrooming’ to make their lives easier (Campbell 2013). This timely project explores the potential for reconfiguring the traditional organisation of customer, salesperson, cash register, tangible things and database, allowing shops ‘stacks’ of both immaterial and material processes to share data that will improve social and economic conditions. That high streets are in trouble is documented by the Portas Review (2011), which describes the impact that internet shopping, out of town shopping centres and the economic downturn have had upon on these spaces of social, economic and environmental exchange (see Miller 1998). One ramification is decreased employment opportunities for local young people. This year the Grimsey Review (2013) offered a deeper ‘digital’ critique of the state of the High Street, embracing a Digitally Economic perspective “To strengthen the high street, we need to increase the number of mutual connections between the nodes or network participants (retail, services, local government, job centres and all others). The more mutual connections, the more adaptive the high street network becomes in response to changes in the success of individuals shops and services.” (Grimsey 2013:17). Our project builds on research and innovation that NCR Consumer Experience (Cx) have initiated in response to the advent of ubiquitous computing in which every shopper carries a cash register in the form of a smart phone. Equipped with a suite of applications, shoppers are able to make purchases, compare prices, track goods, acquire vouchers and group together with friends or strangers to get better deals, all contributing to the consumers range of tactics to make the most from the high street. This project aims to use this sophisticated user knowledge to inform new models for interaction with physical artefacts and their connected data, to improve the high street experience and recover values and relationships that are core to shopping. The research partnership is completed through the investigators expertise and experience in handling the remaining vital component in the context of the connected high street: things. The extraordinary number of products available in a typical high street at any one time is a material manifestation of the big databases and shop inventories that are connected to each thing. Making visible the scale of the goods in the high street to the shopper, through patterns, correlations and recommendations is a critical step in developing a more connected high street. 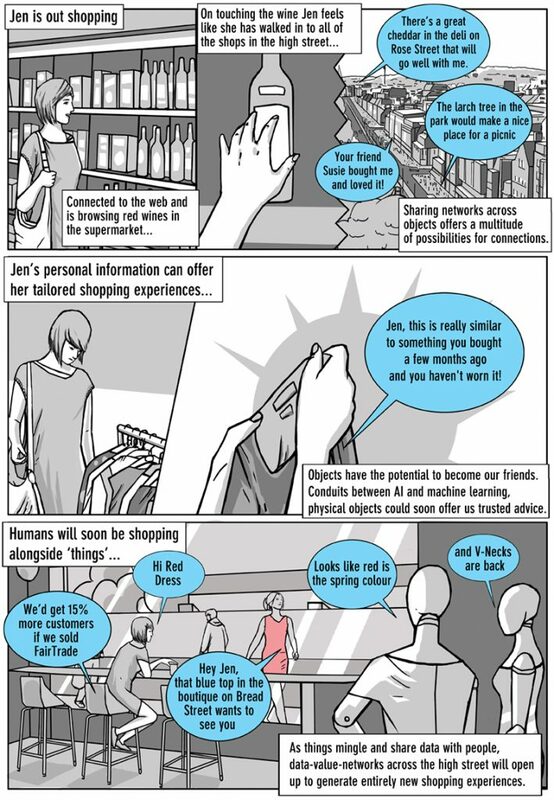 Through a better understanding of how this data can support the shopper and the salesperson to connect ‘things that want to be together’, new models of shopping will emerge and reinvigorate the role of things, people and architectures. This Internet of Things project is firmly located within a tenet that the re-thinking of things, data and people might unpack and ameliorate established practices.